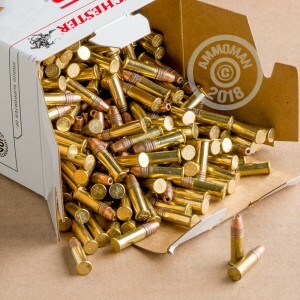 This monstrous bulk package of .22 Long Rifle ammunition will keep you well supplied for plinking, pest control and small game hunting needs for a very long time! These rimfire rounds from Winchester are a versatile choice that any shooter will love and exhibit dependable ignition, desirable ballistics, and an affordable cost. This performance is made possible by Winchester's use of factory rolled brass and precisely engineered primer mixtures. 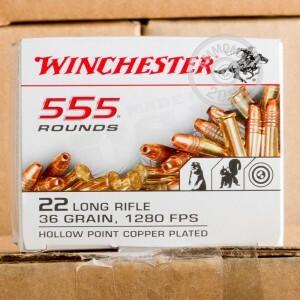 Each round propels a 36-grain copper-plated hollow-point (CPHP) bullet which is common to the .22LR caliber and matches the trajectory of commonly used match and hunting loads. The projectile's copper plating prevents excess fouling which could upset accuracy or lower reliability during long sessions. With a relatively wide mouth hollow cavity, the bullet is well-suited for taking squirrels, rabbits, and chipmunks as its rapid expansion will deliver excellent energy to a target's vitals with a very low risk for overpenetration. In addition, the CPHP's enlarged bourrelet grabs more rifling during barrel travel which improves stability and overall accuracy. Winchester has over 150 years of experience in delivering excellent products to U.S. sportsmen, military, and law enforcement. 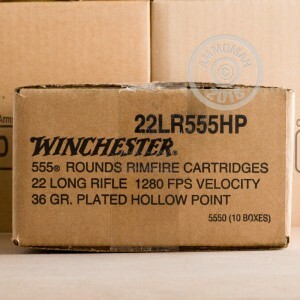 These 5,550-round bulk cases come packaged in ten separate 555-round boxes.